Uniontown City Hall is located at 100 Front Street, Uniontown, AL 36786; phone: 334-628-2011. 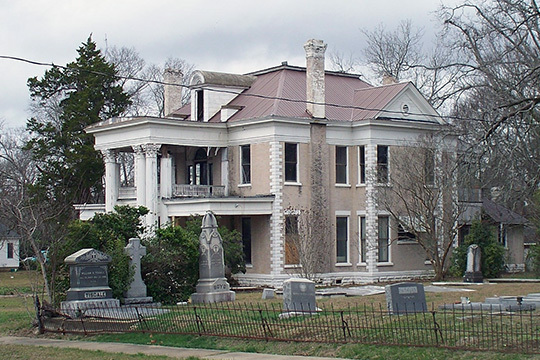 Photo: Co-Nita Manor, Uniontown Historic District, Uniontown, AL. The Historic District was listed on the National Register of Historic Places in 2000. Photographed by User:Altairisfar (own work), 2008, [cc0-by-1.0 (creativecommons.org/publicdomain/zero/1.0/deed.en], via Wikimedia Commons, accessed December, 2014. Located at the highest point between the Alabama and Tombigbee Rivers, Uniontown lies on the watershed that drains eastward into the Alabama River and westward into the Tombigbee and Black Warrior Rivers. Once part of Marengo County when that county was organized in February of 1818, Uniontown became part of Perry County when that county was created on December 13,1819. Originally called Woodville, Uniontown also lies on the western boundary of an area of Alabama known as the Canebrake, a portion of the Black Belt Prairie that has traditionally been recognized as one of the richest farming areas in the state. Historically, Uniontown has served as a local trading and shipping center for area planters and farmers. The architectural resources located within its boundaries are typical of other Alabama Black Belt communities such as Demopolis, Greensboro, Camden, Selma, and Marion. In 1833, the United States Government established a post office called Uniontown at the area known as Woodville. Three years later, on December 23,1836, the Alabama legislature approved incorporation of the town stating "all the territory lying and being within one quarter of a mile of the square formed by the crossing of the two principal streets in said town, and that the northeast corner of which square is hereby declared to be within the limits of the city." The first streets of Uniontown were Water Avenue and Washington Street. Water Avenue, the major northsouth axis, connects Uniontown with Newbern and Greensboro to the north. To the south, Water Avenue became the Prairie Bluff Road, an important transportation route for farmers who shipped crops to Prairie Bluff, a river landing on the Alabama River in Wilcox County. The first twelve blocks of Uniontown, which today are located along Broadway, East, Franklin, Front, Washington, Water, and West Streets, were laid in a fairly uniform grid pattern. Jeff Mansell and Trina Binklev. AHC National Register Coordinator, Mansell and Company, Inc., Consultants, Uniontown Historic District, Perry County, AL, nomination document, 1999, National Park Service, National Register of Historic Places, Washington, D.C.